In the scorching sunlight of the summer, there will be a significant rise in the amount of sweat and sebum that break out all over the body, which may take off the make-up. To solve this problem, quite a lot girls choose to use waterproof foundation products. In reality, this type of product is rather useful for maintaining the make-up all day long. In the article below, we would like to instruct the readers how to create perfect makeup by using the best waterproof foundation products including MUFE Water Blend Foundation, Kat Von D Lock-it Longwear Foundation, Urban Decay All Nighter Foundation, MAC Pro Longwear Nourishing Waterproof Foundation and Milani Perfect Conceal 2in1 Foundation. The waterproof foundation is designed aimed at maintaining the makeup in the wet environment. Therefore, this will be an ideal choice for outdoor performers and the people living in tropical regions and enthusiasts of swimming and going to the beach. The term “waterproof” is closely related to mascara. Waterproof mascara often contains dimethicone-silica copolymer, which is a volatile solvent, and at least a kind of wax. These substances make mascara not absorbent, but the foundation can be easily removed if you use make-up remover. For the choice of waterproof foundation, you should choose the color that is nearly similar to the skin tone so that your skin looks more natural. Before applying waterproof foundation, you need to use moisturizer. Besides, it is very important to choose a right make-up remover. The waterproof foundation only can be removed by the solute that may cause severe effects. For example, it will wipe out the oil necessary for the skin, which makes the skin dry, promoting the aging process. Another note is that waterproof foundation is not for the people owning sensitive eyelids. 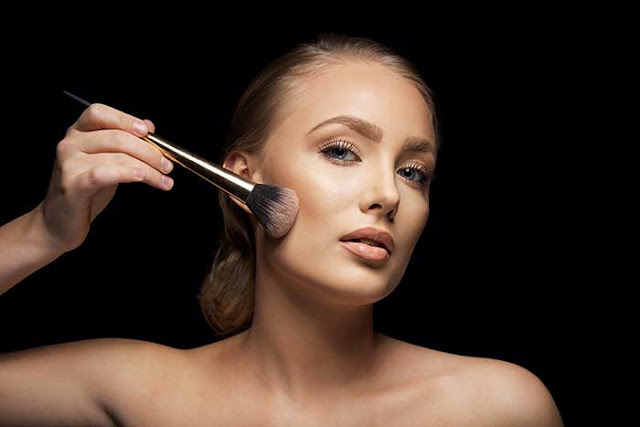 The latest product offered by the MUFE is Water Blend Face and Body, which is comparable to the previous version named Face & Body Liquid Foundation. This product is characterized by the ability to make your skin smooth and soft. With the texture of liquid gelatin containing 80% water, it is quite easy to use this product. In particular, you can use different beauty tools such as a beauty blender, a brush, and even your hands to apply the foundation to your skin. All of them will produce the same results. In addition, many customers show their complete satisfaction with the adhesion and the water resistance of MUFE Water Blend. After three times of washing the face under the tap, the foundation does not stick to the paper handkerchief; and it is estimated that 80-85% of the initial foundation remains almost intact. Kat Von D Lock-it Longwear can cover most defects such as acne, skin with dark color, areas of red spots and even tattoos. In addition, this foundation has an excellent ability to control the sebum, so it is suitable for those who have oily skin. With the perfect adhesion, your makeup will last all day long even if you approach the water, get caught in the rain or have a bath. In reality, quite a few actors, actress and performers choose to use this foundation for outdoor performance or underwater photographing. The base layer remains for at least 7 hours whether you are exposed to water much or little. In case the weather is too hot, 20-30% will be wiped out. Urban Decay All Night creates a flat finish and contains oil-free ingredients which are preferred by those who with oily skin. Additionally, the adhesion and the water resistance are extremely impressive. If possible, you should try using this product for a beach trip. It is certain that it will bring you surprising results. It is not necessary for you to use powders or to set spray. With just primer and foundation, you can comfortably take a stroll along the beach and swim in the sea or the pool. Several hours later, you will find that the foundation still stays intact. This product is an ideal choice for long trips. MAC Pro Longwear Nourishing Waterproof Foundation is the foundation with the high coverage and the good ability to reduce sebum that promisingly gives the customers a flawless and healthy skin. MAC is regarded as one of the best waterproof foundation products because compared to other types of foundation, it can stay on the skin for a long time and is featured by water resistance. You can play or swim in the water for hours without worrying about the gradual disappearance of the foundation. However, MAC Pro Longwear is not appropriate for everyday use because of its thick texture. There is a high probability that your skin will suffer from acne if you do not remove the makeup in a proper method. This product has become one of the most popular waterproof foundations in recent time. With the super-thin texture, Milani Perfect Conceal 2in1 Foundation helps to cover every imperfection on the skin and bring a smooth and flawless skin. The most impressive feature of the foundation is the high water resistance. It can be said that Milani Perfect Conceal is a must-have waterproof foundation product in case you deal with the changeable weather and it may suddenly rain. Moreover, the price is completely affordable to every pocket. If you do not have enough money to have a superior waterproof foundation, this product should be considered. • You always use a primer before covering makeup. • You need to apply the foundation before evenly covering a thin layer of powder on the face. Your makeup will last all day long regardless of the approach of water. • Next, you draw your eyes with a black, brown, or blue eyeliner pencil; then fix the line with the eye powder with the same shadow. If your eyes are too oily, you can put a layer of colorless powder. • Compared to the powder, the cheek cream will stay long on the skin. You also can cover the cream with a layer of powder if you want to darken the color. • To completely set your mind at ease when you are exposed to water, you apply the gel to the eyeliner, lipstick, eyebrow, cheek or eye powder. If you desire to retain your make-up during your beach trips or while taking part in aquatic activities, it is recommended that you should use the waterproof foundations above. Hope that with the given information about the best waterproof foundation products, you will select a type of suitable foundation during hot days of the summer.